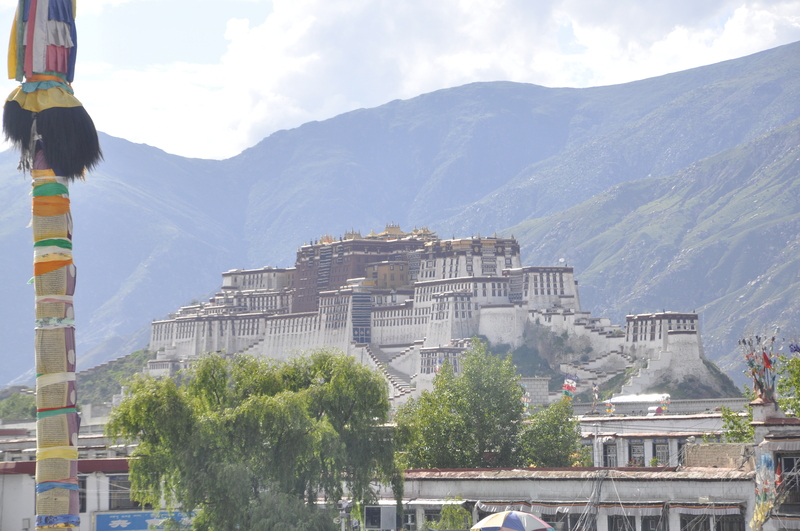 The Potala, the great palace of the Dalai Lama, one of the architectural wonders of the world, seems to grow out of the hill where it is built. To get inside the Potala you need a Tibetan guide who will accompany you on the tour. Once you enter your ticket is stamped with the time and you have one hour, if you leave later than an hour your guide is fined. It is unbelievable as we enter. Room after room filed with Tibetan art, the walls and ceiling covered with murals, then tangkas hanging over the murals and then big cabinets and shrines on every wall filled with statuary. Our group has two guides; an American professor and a Tibetan named Tenzin. Inside the Potala we are in a large ceremonial chapel filled with a long row of life sized statues when Dan, our American guide, runs into a Tibetan he knows. The man is a lama but is not dressed in robes. They are delighted to find each other and Dan has gifts for him. They embrace and talk for a few minutes and then we continue on the tour route. We are moving down this long corridor with a stream of other tourists and pilgrims when all at once a door opens and the lama that Dan knows steps out and beckons for us to come through the door. I couldn’t be more surprised. Suddenly we are off the tourist track and going into the back rooms of the Potala. He takes us through several rooms where there are no tourists, deep into the interior of the building, until we end up in a room with brightly colored murals and incredibly elaborate woodwork and long beautiful tasseled umbrellas that hang from the tall ceiling for what appears to be twenty to thirty feet. This amazing room is where he works. It is courageous of him to speak with us privately at all. Here in Lhasa if a Tibetan monk talks to Westerners he can end up being interrogated by the Chinese who want a full report on everything that was said and he can even end up in jail as a result. So I understand the pressure, the fire in the belly of being under constant oppression, of going to classes every month where they are forced to denounce the Dalai Lama and swear allegiance to China. It is truly heartbreaking and my sympathy goes out to him and the Tibetan people who are forced into this awful situation. This entry was posted in Uncategorized and tagged Tibet. Bookmark the permalink.